On the right is the card I made with one of the background. 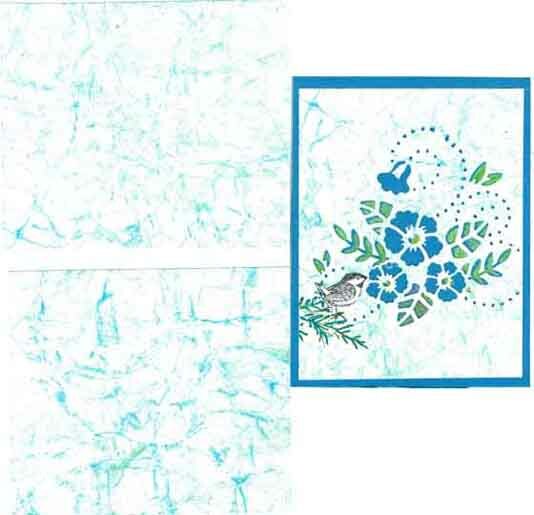 The focal image is made with a die made by Tonic Studios exclusively for Scrapbook.com called Blossom Spray. It is a Dot and Drop Die which provides dots for placement of Nuvo drop placement. I used a glitter pen but hope to find some Nuvo drops soon. My chickadee bird stamp smells the fragrance the spring flower. How pretty! I love th little bird! That is a neat die for use with the Nuvo drops. Your backgrounds and card are so pretty! I love the die and your little bird. Thanks for doing my challenge! Such a pretty card! I like how you combined the bird with the flower die. I've never heard of a Dot and Drop die.